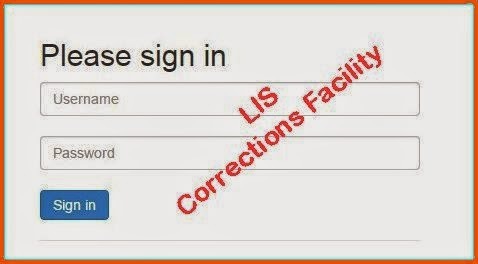 Recently the Learner Information System (LIS) has introduced a Change Request Facility to work on various corrections to the basic learner's profile like his name, age, learner reference number (LRN), among others. With this application everything would be straighten and made accurate especially the learner's school profile records. To make this corrections request facility, valid, authentic and reliable, it requires two key persons to handle this thing. One is the class adviser who makes a request for correction of learner's profile and the other one is the school head who approves or disapproves the change of requests. Teacher especially class adviser may find this tutorial very useful and helpful. This correction request facility may rectify erroneous entries on the learner's enrollment profile made by lack of orientation, lack of time, or shall we say miscommunication. Likewise, the school head may find this tutorial easy for him to approve the request made. In short, this facility is involving two responsible persons in the school for the genuineness, authenticity of the learner's vital records in school. Change of Date of Birth, for example. These are the things to do for you as a teacher. 2. 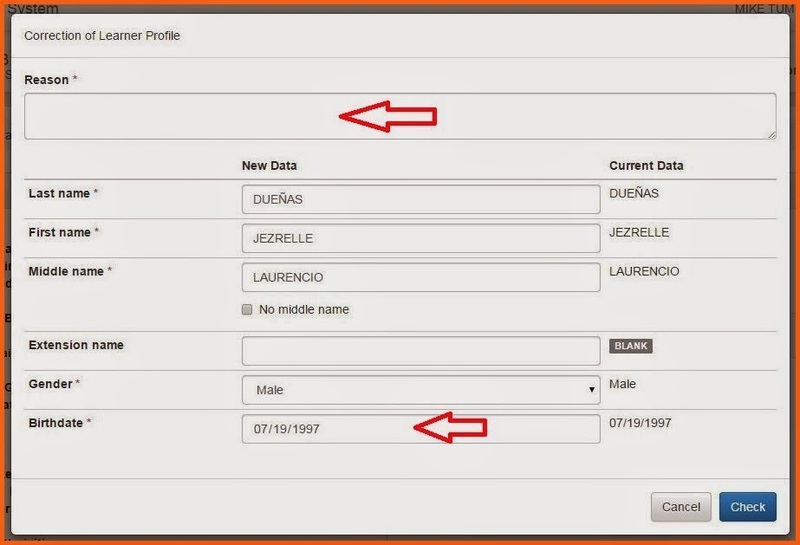 Once logged in, click the Masterlist and proceed to the name of your learner whom correction to his profile be made. 3. Once you found it, click the profile of the learner, then click the three dots along with the pencil icon and clock icon. A pop-down menu appear for you to select your correction to effect like "Correct basic profile" or "Deactivate LRN". 4. 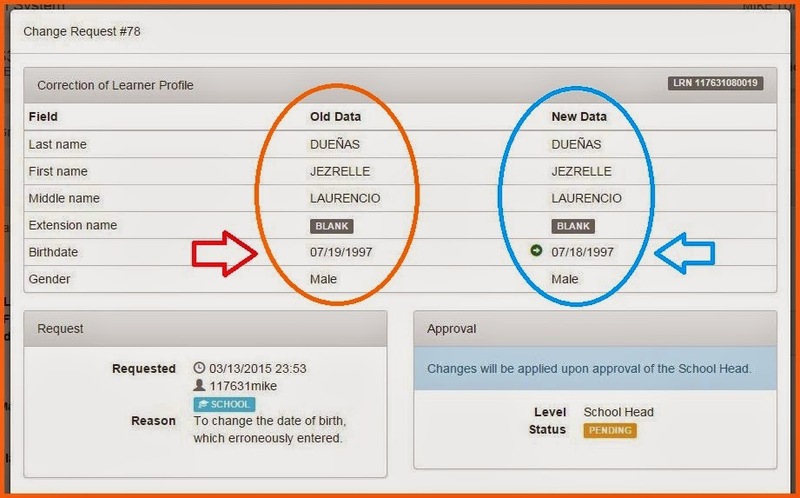 Since you want to rectify the wrong date of learner's birthday, so click "correct basic profile." Then state the purpose on "Reason" box. After you entered the correct date, click "Check" at the lower right hand corner of the box. 5. After you click "Check", you'll be reminded to continue editing for actual submission, if there's any. If not, then click "Submit" in green box. 6 After you submit it, you'll be prompted that your request submitted is pending School Head's approval. Then click "Close" at the left lower portion to end your correction task. 7 Now you want to check if it's done or not. Click the three dots icon again. You'll be prompted that tbere's a pending request and you can't make another correction until it is acted upon. So proceed to Masterlist and locate the learner's name. Click his profile. You'll see a note just below the learner's "profile" that the learner has a pending change request. You want to see it. 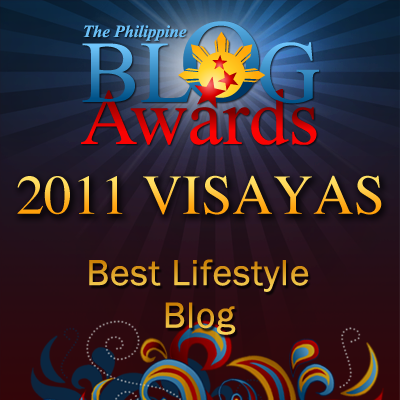 Click the "view" button in orange color. Then click "close" button. And log out. 1. He logs in, using his username and own password. Once logged in, he clicks "Data Corrections" to view the pending change request. 2. 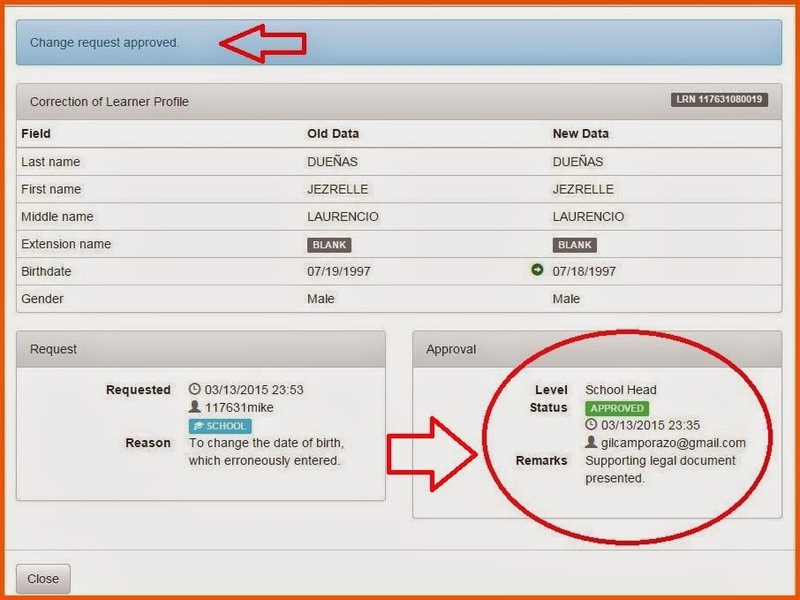 He clicks "view" and the learner's old data and new data are displayed. There is also a box for "Approval remarks". He writes his remarks and then click "approve" button in green. 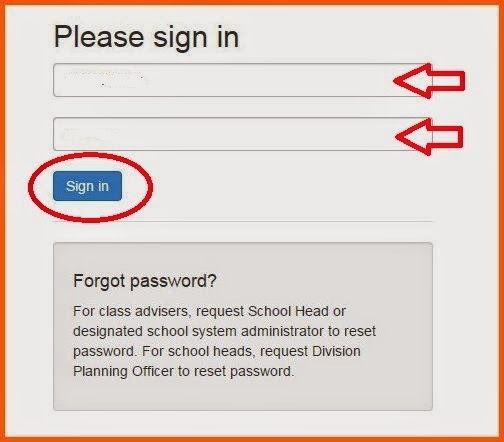 If the school head failed to put his remarks, "Form Validation Failed" appears. 3. When appropriate approval remark is appended, "change request approved" appears. Then the school head closes it. 4. 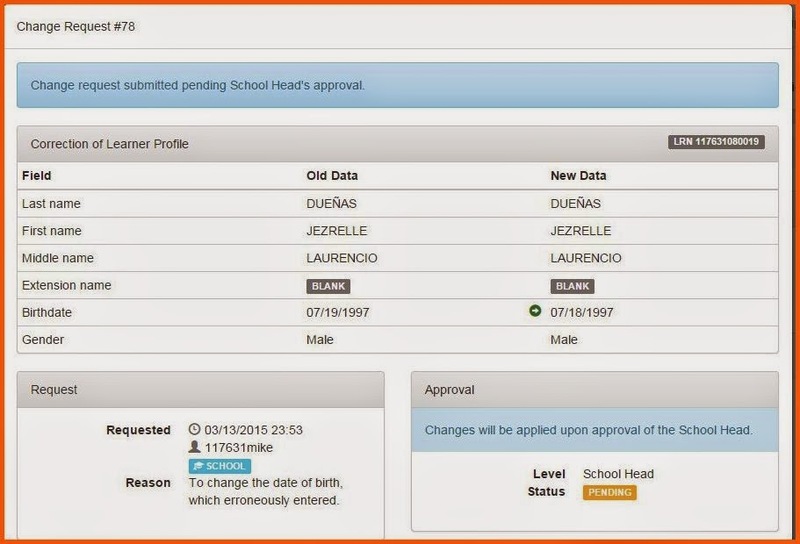 To check the number of change request made by teachers and its status, the school head will click the "Data Corrections" button, the "Change Requests" pops up. He may check the various requests on the following category: pending, approved, and disapproved request. Hoping that these simple, easy tutorials would be of help to every teacher, and to the school head as well. Sir availbale na po ba yang facility na yan nagun? As of this time, this facility is not yet activated. Just wait for the announcement.